Zombies will flood the Panther Trail on Saturday as participants try to get past them to make it to the finish line of the third Zombie Run. The Society for Human Resource Management is putting on its third Zombie 5k Run/Walk for Multiple Sclerosis on the Panther Trail. Christian King, the society’s president, said the run was started by a group of students taking a project management class where they had to host an event and had to find a sponsor. The society is an organization within the School of Business that has put on the run since it was first organized in 2013. King said participants are able to sign up for the race as either a runner or a zombie beginning at noon on Saturday, which is also Halloween. The run is scheduled to begin at 1 p.m.
“We encourage participants to come around noon, so we can prep the runners and zombies,” King said. People from the Doudna Fine Arts Center will be at the trail to help the participants become zombies before the race starts. 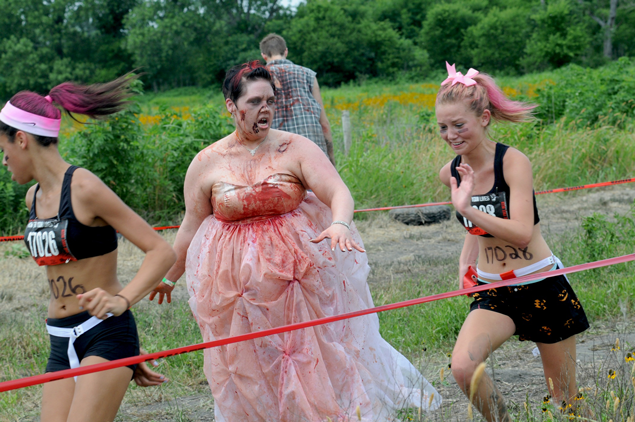 The goal of the run is for participants to make it to the finish line without letting the zombies take the flags attached to their waist. Each runner has two flags attached to their waist and one colored flag attached to their back. King said there are three zones separated by colors where running zombies can take the corresponding flag off their back. The walking zombies in the other respective zones can take off the other two flags located on the participant’s hips. According to the Facebook page, the zombies will be hidden and chase people in an attempt to infect people. “If you loose all your flags, you ARE INFECTED,” the Zombie Run Facebook page said. Pins will be passed out for how many survivors there are and how many ended up infected. King said all of the proceeds of the run will be donated to the National Multiple Sclerosis Society, and the run is also something to raise awareness for MS.
“Our goal for the event is to raise $1000 for Multiple Sclerosis,” King said. King said people who are not able to attend the race are able to donate to their goal through links posted on the Zombie Run Facebook Page.